Lock in a great price for City Hotel London – rated 8.3 by recent guests! Very close to the Underground station, and reasonably good value for money in Central London. Quality of stay relatively in line with a 2- or 3-star hotel. It was a good location for the most part and was affordable. The staff was really nice and was easy to work with! We got the King room with private bathroom and it was cozy with a great set up. Also, let us keep store our luggage after check out which helped us out a lot! Overall, would stay there again. The Hotel was in the process of remolding, I’m sure when things are finished it will be very nice. The staff was excellent and helpful especially Emall at night and Salina during the day. (Please forgive me if I spelled anyone’s name wrong). As close as you could get to the attractions at a reasonable price. Staff are just fantastic. Local bars and restaurants are excellent, especially Joe's Kitchen 100m away around corner. Laundromat 300m away. Absolutely brilliant value for money, location is 29minute walk from the London eye etc one way and 10minutes to tower bridge, next door to an underground station. No noise from outside, perfect room and very friendly and helpful staff. Nice restaurant and place for breakfast 1minute round the corner! Ok so I literally lived inside a coffee shop which is so cool and kinda funny. The hotel is clean and well kept close to everything. Nice room, clean and in a great location. Friendly staff. Great location right next to tube Station, zero noise from the station. Only a short walk to Borough market and Tower Bridge. Staff were very friendly, the room was very clean, modern and was well appointed. The bathroom was very good, shower was excellent - apart from no soap holder. City Hotel London This rating is a reflection of how the property compares to the industry standard when it comes to price, facilities and services available. It's based on a self-evaluation by the property. Use this rating to help choose your stay! City Hotel London offers modern accommodations next door to Borough Tube Station, and a 5-minute walk from London Bridge Rail Station. Tower Bridge is a 10-minute walk away. A 24-hour reception and express check-in/check-out are also available. It has modern, well furnished rooms, with a flat-screen TV and tea/coffee making facilities. Most of the rooms have an en suite shower room. 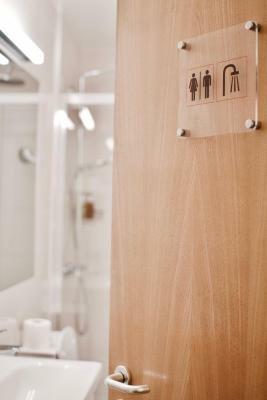 Basic rooms have a washbasin in the room and a shared bathroom. Free WiFi is available in all rooms. 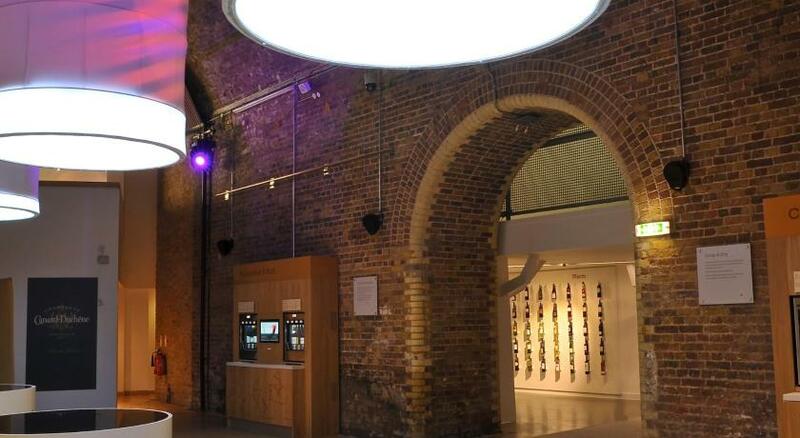 Borough Market, The Globe Theater, Tower Bridge and Tate Modern are all within a 10-minute walk, as well as The Shard. Waterloo Station can be reached in 3 minutes via tube from London Bridge Station. The City Hotel London does not have an elevator. Ground floor rooms can be requested and are subject to availability. When would you like to stay at City Hotel London? A contemporary open-plan private bathroom, flat-screen TV and tea/coffee making facilities are in this room. The bed is 4 ft wide which is a large single. 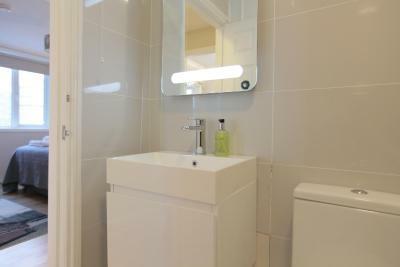 An private bathroom, a TV and tea and coffee making facilities are included in this room. The bathroom is located outside of the room on the same floor. The shared bathroom is used by a maximum of one other guest. It has a shower and a dressing gown is provided for personal use. A flat-screen TV and tea/coffee making facilities are also available. Offering wooden flooring and air-conditioning, this room features a desk, a flat-screen TV and tea and coffee making facilities. It also comes with an private bathroom with rain shower and free toiletries. This triple room features a private bathroom, a TV and tea/coffee making facilities. Since opening the business in 1966, London City Hotel has been through many changes to reflect the development of the area. 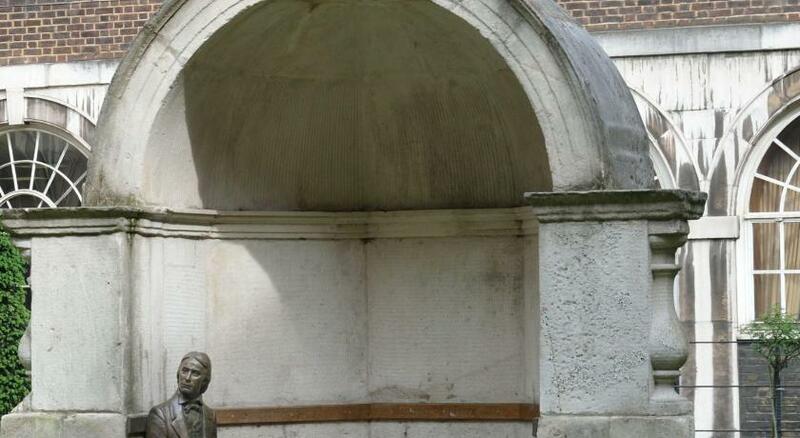 We have many of London’s best features right on our doorstep. 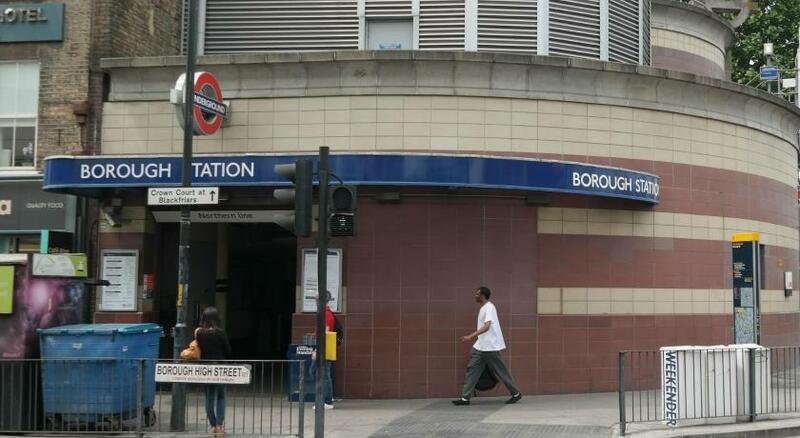 The hotel has a unique location, it is situated right next door to Borough tube station, it would be impossible to be any closer! All our staff aim to offer a friendly and professional service. The rooms are clean, comfortable and affordable with high quality beds, pillows and towels. House Rules City Hotel London takes special requests – add in the next step! City Hotel London accepts these cards and reserves the right to temporarily hold an amount prior to arrival. Please note, an extra bed can only be accommodated in the Studio Apartment. The photographs of the rooms are for illustrative purpose only. There is a 24-hour reception service on-site, but if you expect to arrive after 02:00, please inform London City Hotel in advance. Ground floor rooms with air conditioning must be requested in advance, as they are subject to availability. Please note, for nonrefundable bookings, the entire balance minus GBP 1 will be charged at the time of booking, with the rest charged on arrival. We left our bags for 6 hours and found out there had been items Stolen from both bags . Also I found my i-pad air had been put back in the bottom of the bag ( I always place between clothing to keep safe ) my suspicion was only raised when we unpacked . They were the only ones with keys and the cleaners had been in . I will be reporting this to the local council and the police . They denied it was anything to do with them !! You have a responsibility to your future bookings to tell them the whole truth do you not . We travel across the globe and never any problem. This to happen in my capital city ,I’m disgusted . I’m not going to let them get away with this , not for me but for other hard working customers. I do expect a sensible response. Located above a cafe so narrow stairs to reception. Entrance and hallways are a bit glum looking. The staff were very helpful, I had a huge bag so when I arrived they changed my booking to a lower floor so I didn’t have to carry it up so many stairs. Was surprised by the pleasant en-suite bathroom facilities, nice shower. Everything was clean. They provided free tea, coffee, biscuits and pleasant smelling shower gel, shampoo and hand soap which is more that some of the larger budget chain do. Comfy bed, clean, lovely shower and really quiet for a busy London location! There is no lift. So it's a few flights of Staircase upwards. Our room window was facing the air con compressors and the noise went on and on thru the night. The room was also very small. Good place to stay. Simple and clean. Check in/out pretty strict. Tv didn’t work shower tray had a bid crack with was sealed over . Room would be stuffy in summer although fan provided. Window did not have vent option to leave open at night without hearing too much noise from outside. Curtains a bit tired. 2 bulbs not working in bathroom. Pillows very hard and small. No lift so 3 flights of stairs to climb but not that big a deal for me but would be an issue for people with mobility issues. Good location -close to my office and easy to find next to the Tube. Clean quite spacious room with modern facilities. Good sized bed and nice linens. New looking shower and bathroom facilities. No noise from other residents. Friendly receptionist and handy to have the cafe to buy a healthy breakfast. Good yoghurt and granola and choice of breakfasts -different to boring standard English breakfast. Way overpriced for the room plus the picture does not reflect the room. Strong bad smell in stairways. Fortunately not in the room. Entrance is via a door intercom, when we arrived the traffic noise made it hard to hear what the receptionist was saying. Room was very good with tea coffee and biscuits, hair drier included, television and wi-fi also in room. Very clean and furnished with two armchairs, small coffee table and console table and chair. None of the sockets in our room worked so we couldn’t use any lamps or appliances. The staff was friendly and I liked the bathrooms. There was an exposed nail on the lino floor right outside the shower. Luckily I saw it before I stepped on it. That's the only fault I would give. Loved it, great hotel so convenient.